YES! Association/Föreningen JA!, SMOKING AREA (detail), 2012. Installation view. The YES! Association/Föreningen JA! is an institution, an art worker, and a group of people working to overthrow heteronormative, patriarchal, racist, and capitalist power structures by redistributing access to financial resources, space, and time within the art world. The collective’s first aim was to help Sweden’s public art organizations tackle their inequality problems by offering the chance to sign an Equal Opportunities Agreement. Their new multipart work SMOKING AREA is on view through December 21 in the exhibition “Anti-Establishment,” at the CCS Bard Hessel Museum in Annandale-on-Hudson, New York. WE WANTED THE BREEZE THAT PASSES BY HANNAH ARENDT’S GRAVE, which is located on Bard’s campus, to enter the exhibition. We wanted to connect the collection, the gallery space, and the grave through her nonvisible presenceto have smoke that would linger. It was a physical reflection. We installed a sixty-square-foot Smoking Area inside the Hessel Museum of Art, which shows a possibility for changing, or disrupting, the legal structure within an institution. 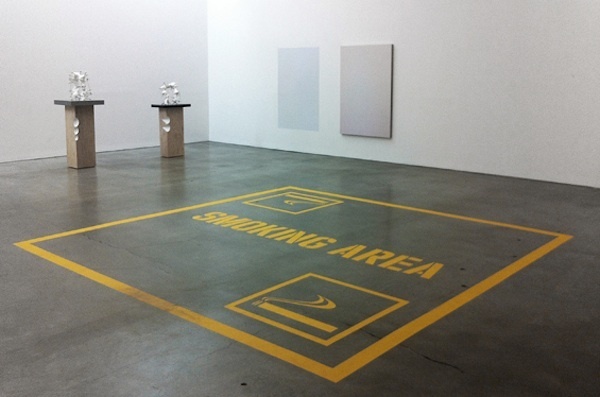 The floor is painted with solid yellow lines the color of traffic signs and the cordoned-off space (modeled after such areas in train stations and other semi-outside public spaces across Europe) boldly reads SMOKING AREA in large font, complete with graphics of two lit cigarettes. The museum had to reevaluate. “Do you actually intend to have people smoking in there? Or is it just a painting?” There’s no way to really answer that. Visitors are activated; they are asked to make a choice: to smoke or to not smoke. We borrow from Hannah Arendt when we say: There is no doubt that the ability to act is the most dangerous of our abilities and possibilities. We used a large part of our exhibition budget to bring Swedish writer and translator Annika Ruth Persson to Bard for one month so that she could research documents in the college’s Hannah Arendt Collection for her literary project on Arendt in the 1940s. We titled her monthlong stay, which continues into November, Invitation. It’s a performance that you have to imagine.